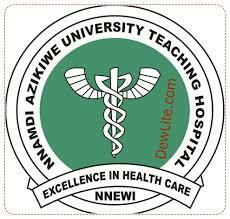 The management of Nnamdi Azikiwe University Teaching Hospital (NAUTH) Nnewi, wishes to dissociate itself from the illegal/fake websites on the internet used to advertise the sales of Admission forms of the School of Nursing, Nnamdi Azikiwe University Teaching Hospital (NAUTH) Nnewi. The general public is hereby warned to refrain from using such sites as they are the handiwork of impostors and fraudsters who are out to dupe the innocent prospective candidates. The fraudulent websites are being investigated, by the law enforcement agents for necessary action. The form is not sale online. It can only be obtained inside school.